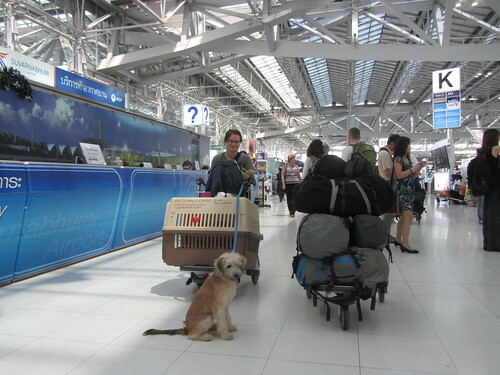 Mango has traveled over 2000 kms by motorcycle, he has traveled by ferry, by car, by train and by tuk tuk. But tonight he meets his biggest challenge yet: airplane. This evening we are Canada bound, unfortunately the shortest flight to BC that we could find still clocked in at 30 hours. That was 5 hours to Seoul, then almost 12 hours there on a stop over, followed by another 10 hour flight to Vancouver. There was one that would have been 5 hours less but involved switching airlines. We went for the 5 extra hours as we felt it was better to keep him with 1 airline, as there is a much lower chance of a screw up! Getting Mango ready for export to Canada (and the same is true for the States) was relatively easy. The vet chipped him when we picked him up (she was so happy Mango had a home she did it for free) and gave him his rabies vaccine (70 Baht, or less than 2 Euro and a little over 2 dollars!). From that point on Mango was 90% ready to fly. He needed an export permit for Thailand to let him out, a health certificate for the airline to take him on-board, and a rabies certificate for Canada to allow him in. The good news was that all three were done at the same office at the Bangkok airport. And for the fee of 50 Baht (or a little more than a Euro and a little less than 2 dollars!). There was only one snag. The website is in Thai, and the website we got the translated information from (see above) said to go 7 – 3 days before the flight. We went on day 7 to make sure we had time to rectify the situation should something go wrong. Do not do this. You will just end up stressing yourself out for no reason. They will not, as in flat our refused even when I became hysterical, check him over or give his certificates. They told us if we were flying on Tuesday evening to come back Monday or even on Tuesday. This did not fly with me, and I started to shake and finally I cried. I had images of him being refused because of something stupid like his rabies vaccination date and then what? I remember screaming something about if they would kill him in that situation. At that point the German stepped in as the point of rationality and asked if she would check his papers now to see if everything was in order. They were. Short of Mango becoming sick between then and now we were in the clear for our certificates. 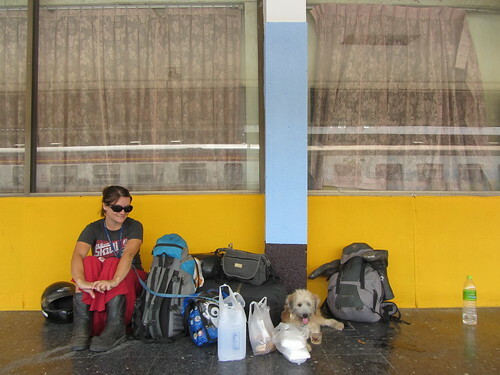 And so today we left for the airport early (as in almost 12 hours, the livestock office is open 9 – 12 am and 1 – 4 pm, nothing happens over lunch time) to get Mango’s papers. It took 3 hours in total, (waiting to be seen, check up and chip scan, and then the hour wait while they prepared the documents). And that was that! Now I am at the airport waiting to board the flight. Let’s hope it all goes as well on the Canadian side. 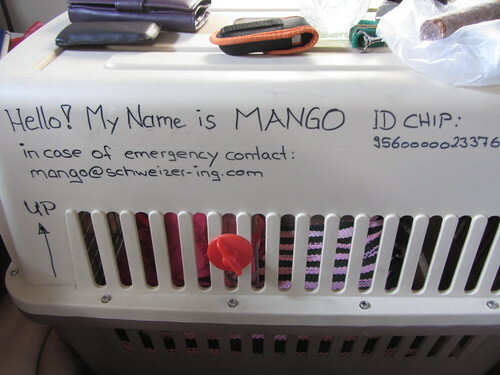 I also hope they let us walk Mango in Seoul, or that they do so, because a little over 11 hours is more than enough time to do so, and the poor little guy will be busting. He is such a good dog about doing his business not just outside, but away from his home as well. He does not like even going in the garden of the guesthouses we stay in! 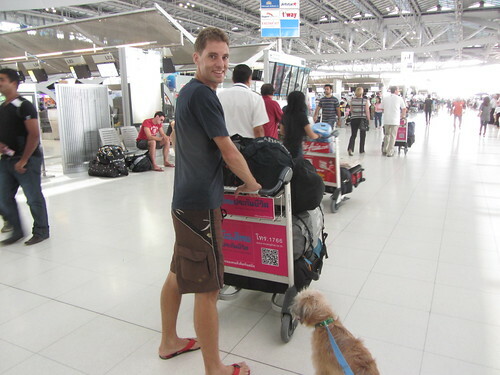 The easiest way is to go to the main terminal of the international airport (Suvarnabhumi) and take the bus No. B from there. It starts at the bottom road (3 roads above each other) at the terminal. The bus comes about every 15 minutes and is for free. At the end of the long building are a few stairs which lead you into the building. There is no sign on the door but when you walk in the animal office is the first door to the left. Sherrie was born and raised in Newfoundland, has her home base in Germany, and at any given time can be found just about anywhere in the world. Addicted to books, travel, chocolate and motorcycles, a perfect day for her is riding her bike followed by drinking good coffee and reading a good book or writing one. Anyone Looking To Ship A Motorcycle From Russia To Chile In October? Buying Honda Waves In Asia: Was The Moscoot Worth It? Destination: Marina & The Russian Black Sea Coast! English Translation Of Fernweh: A Trans Continental Motorcycle Adventure Is Out! Malaysia: An Awesome Place To Ride!?! Mission Impossible: How hard is it to find a head lamp? One year on the road! Sjack The World Independent Film Out: Moral Of The Story Live Your Dreams! World Travel With Baby (And Babies): With A Sail Boat?